5 Acres & A Dream: Hallway: So, What Are We Planning To Do? When I showed you the laying of the new hardwood floor at the end of the hallway a couple weeks ago, I mentioned an intended purpose for this area. Some of you were curious about that, so here's the scoop. What we're doing, is reallocating space. Our house isn't terribly large, not counting porches, it's about 1500 square feet. This is more than adequate for two people (and their pets and hobbies), but we felt that the space wasn't utlilzed well, particularly the wide hallway which is just a few inches short of 5 feet. bathroom is the one we're working on. It did very well to accommodate bookshelves, but when Dan lamented not having a master bathroom, my mental wheels started turning. What we decided to do is use part of the hallway to create a master suite. 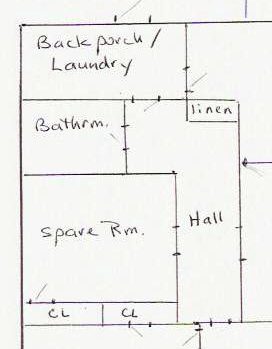 The proposed plan for a master suite. We'll wall off the back of the hallway with a bookshelf. Behind it, (where we just put down the hardwood floor) will become a study for Dan. 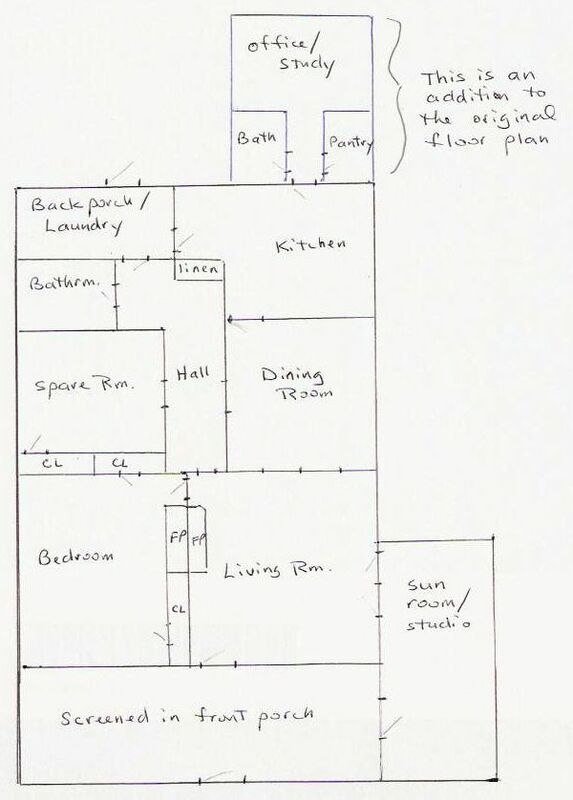 The spare room will become the master bedroom and a second doorway will be created to give access to the bathroom, Dan's new study, and even the back porch for a "private" suite of rooms. The bathroom is almost done, and it won't take much to finish Dan's room. He never felt that he needed a lot of space, just enough for his desk, drafting table, and some shelves. After that, we can start clearing out the spare bedroom, which is currently used for storage. Rebuild the closet. The bedroom closets in this house are long and shallow with short narrow doors so that they are difficult to access. 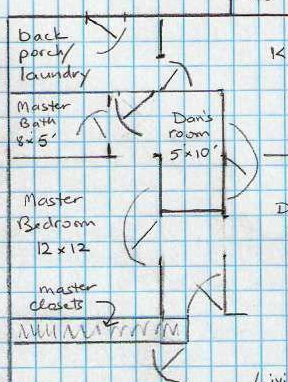 We plan to put the two adjacent bedroom closets together to make one bigger, deeper, ceiling to floor closet plus storage. Floor? Is pine tongue and groove. There are no subfloors in this house. We've been adding vapor barriers as we've addressed the floors, and either put down hardwood or porcelain tile in the bathrooms. This room may get a carpet! New door. We'll use the old one from the hall bathroom because a 32 inch door is too wide for that tiny room. (We'll replace that one with a bi-fold). It's likely we won't even get started on this phase until next fall. Summer is outdoor project time, and we have quite a few outdoor projects. Unless, of course, it keeps on raining the way it has been. In that case, we'll make quite a bit of progress in the house. Good reuse of wasted space! looks like you're not running out of jobs yet - good luck (ie. no nasty surprises during the work) with all your plans! Our place is as small or maybe even smaller than yours. When space is found, it's used not wasted. I think you've made a great use for the open space. Right now we've been concentrating on outside, expanding the garden and working on the landscape. For two days it's been raining, so I find myself under our covered porch potting plants in 5 gallon buckets and pots. Looks like much better use of space than just hallway. Small spaces can be so underutilized. Looks like you are doing a great job reallocating in order to make the best use of space. Look forward to watching the progress! A great way to put otherwise wasted space to use! We can keep the smallest, east-facing room enclosed for a dressing room. Oooo! Bettina, I can see how those stone walls would really confine any creative remodeling ideas. But it sounds like you've made the best of it! Sandy, it's true, summer is for outdoor work especially the garden. This project will likely be on hold for the summer, unless the days get too rain drenched! Dan hopes to at least finish the bathroom because we could use it. TL, I think so too. I'm sure they had a reason for those wide hallways when these old houses were built. Someone said they were actually breezeways, when doors were open in both front and back of the house. DFW, I think with small spaces we're forced to think outside the box! It was fun getting the inspiration. Jacqueline, sounds like a brilliant plan! The other thing we discussed for Dan's study was a huge walk in closet instead. But then, neither of us has that many clothes and I think combining and opening up the two old closets will do very well for that. It's amazing what the two of you come up with! If I could hover over a place (you know, like a bird's eye view) I might be able to see the whole picture and come up with good ideas, but being a visual person I have a hard time seeing through walls and such! But you do a great job of being able to see how something is going to look before even starting. Kudos! All good planning! However, I'm anxious to see your "storage room" become, once again, YOUR creative room. That's the room I'm excited to see happen. Wow, that's a big winter's project. It's sure to keep you busy. But it looks like it will give you better useable space. You're right...wide hallways served as breezeways during hot summers. Plus my grandmother and great aunts had summer kitchens to help keep the heat out of the house. That's why one sees porches on the back of old houses....it was the location of the summer kitchen. Not a full kitchen, mind you, but where the cook stove was moved to. Oh, you two are ambitious!! But it is so nice to be able to carry out those plans, too. Keep us posted on your progress, okay? Mama Pea, you know what they say, necessity is the mother of invention. :) Actually, Dan is like you so that when I come up with ideas he often thinks I'm nuts. Fortunately he's game and with his skill, things usually turn out. Janice, thanks! Ah yes, storage. It may be awhile, but I'll be delighted to get it back too. Su Ba. We turned our back porch into a summer and canning kitchen because of the heat. Even with air conditioning, I figured it would have to work a lot less if I kept most of my cooking and canning heat out of the house!